LONDON (Reuters) - A substitute for the widely-used Libor interest rate benchmark must be in place for banks to use by the end of 2021, the head of Britain's financial markets regulator said. Libor, a daily rate in a range of currencies, is based on submissions from banks of interest rates they believe they would be charged by others for borrowing money. Banks have been fined billions of dollars for trying to manipulate the benchmark, forcing a rethink of its future. The benchmark is used to price financial contracts worth $350 trillion, ranging from home loans to credit cards. Bank of England Governor Mark Carney said this month that reference rates should be based on market transactions not judgments. 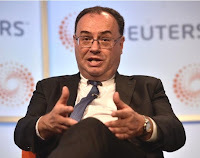 Andrew Bailey, chief executive of the Financial Conduct Authority, told an event in London on Thursday that work must "begin in earnest" on shifting to an alternative index, saying the end of 2021 would offer time to ensure a smooth transition. "By having a date by which transition will need to be complete, however, we give market participants a schedule to plan to, and make it easier for them to engage as many counterparties and Libor users as is practicably possible." Libor must be replaced because there are not enough transactions underpinning the rates, Bailey said, adding that for one Libor variant only 15 trades were executed in 2016. A Libor based on "expert judgment" of banks is fragile, and there is little prospect of the markets becoming substantially more active in the near future, Bailey said. "In our view it is not only potentially unsustainable, but also undesirable, for market participants to rely indefinitely on reference rates that do not have active underlying markets to support them," Bailey said. Banks have voluntarily agreed to contribute rates to Libor until 2021, but if this phase-out deadline was on course to be missed, there would be a "push" from the authorities, Bailey said, without elaborating. At least six bankers on both sides of the Atlantic have been sent to prison for manipulating Libor, although some in the United States are still awaiting sentencing. Libor had been compiled by the now defunct British Bankers' Association, but following the rigging scandal, this was transferred to ICE Benchmark Administration (IBA), part of the Intercontinental Exchange (ICE.N). IBA said changes to Libor have minimized subjective judgments. "Having consulted with regulators and over 1,000 market participants, we believe that the evolving Libor has a long-term sustainable future," it said. The BoE has already been refining its overnight sterling funding rate SONIA, which is based on actual transactions, as a sterling Libor substitute. Earlier this year a BoE industry working group backed SONIA, which the central bank administers itself, as the substitute for Libor. There could also be a second substitute benchmark to measure bank credit risk and funding markets that is based on a mix of SONIA and a proxy bank credit risk measure, Bailey said. Setting a date would focus minds just as the end 2017 deadline to phase out Switzerland's TOIS reference rate triggered serious work on moving to the SARON rate, he said. The Swiss National Bank said on Thursday it would in due course select an alternative to the Swiss franc Libor as a tool for guiding monetary policy. "Libor will not be scrapped until the end of 2021," it said. Banks and IBA could continue to produce Libor after 2021, if they wanted to, Bailey said. Existing financial contracts that reference Libor and go beyond 2021 could be amended. The U.S. Federal Reserve is developing a home-grown benchmark based on the repurchase agreement or repo market as an alternative to dollar Libor, which is used in some $150 trillion of private and exchange-traded derivatives. The European Central Bank said in May it could replace Euribor, a euro-denominated counterpart to Libor, with a reference rate of its own. Story and photo via Reuters.